The Ethiopian-Eritrean federation, a product of a United Nations resolution, came into existence in 1952 and was abolished ten years later. The primary objective of this book is to examine the rise and the fall of the federation in the nght of present-day realities. This central theme is placed in context by a reconstruction of Eritrean political organizations during the crucial postwar years. The work includes a short account of the war between Eritrean nationalist forces and the Ethiopian government, which led up to the emergence of Eritrea as a sovereign state. Based primarily on archival sources at the Public Record Office in London, Eritrea and Ethiopia argues that no other group in the region has repeatedly succeeded in shaping its political destiny as the Tigreans of Eritrea have. 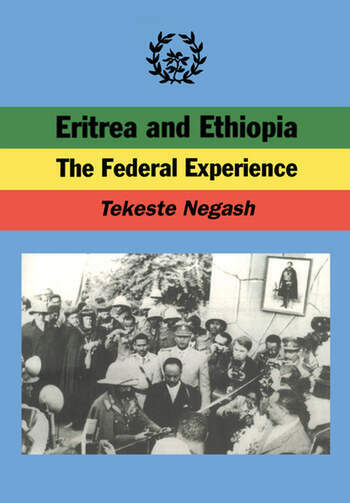 Negash maintains that the federation was abolished by Eritrean social and political forces rather than by Ethiopia. The UN-imposed federation, together with its accompanying constitution, were doomed to fail, as these were foreign to Eritrean and Ethiopian conceptions of political power. The attempts of the Eritrean Moslem League to defend and maintain the federation were frustrated by internal contradictions, by the Unionist party, and by misconstrued perceptions of the division of powers between Eritrea and Ethiopia. The author looks closely at the impact of the British period on Eritrean society. Such an examination provides a better understanding of the background to the conflict and it is an important part of Eritrean political and social history. This book is the story of the slow but steady dissolution of the federation as seen and observed by the British diplomatic corps. Between 1952 and 1962, there were about thirty British nationals assigned to the Eritrean government. These expatriates kept in touch with the British consulate-general whose responsibility was to protect the interests of British nationals as well as to report developments to London. The conclusions and interpretations found in this book are, to a great extent, based on that documentation. Eritrea and Ethiopia is the first study of its kind to follow the rise and fall of the federation. It will be a challenging and insightful read for students of African affairs, diplomatic historians, policy studies scholars, and political theorists.